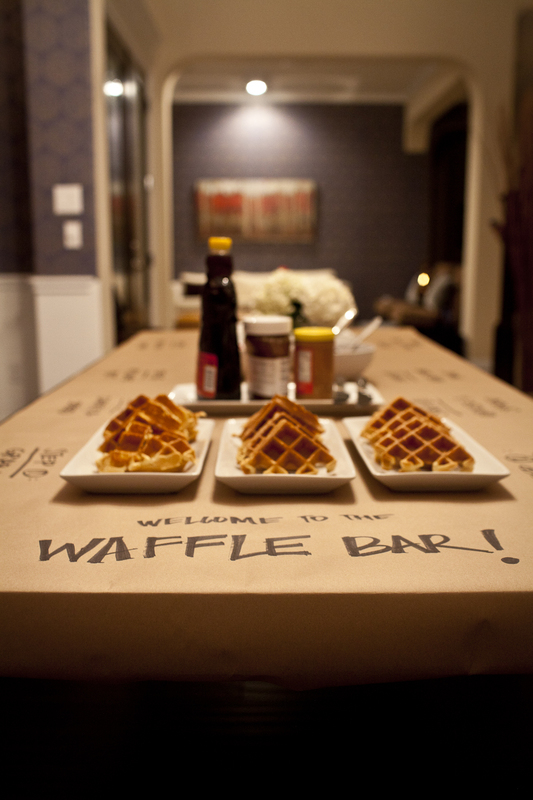 Welcome to the Waffle Bar! When my plans for my celebrating my birthday fell through at the last minute, I decided to just have a small, intimate gathering at home. Even still, I knew I wanted to do something unique and original. I had just done a dessert bar at my son’s 1st birthday party last month, so I wanted to do something a little different. And I wanted it to be on a smaller scale, perhaps just one main item instead of a whole bunch of different foods, especially since there would be a lot less people. I thought maybe I could do a s’mores bar. But that would require some kind of heat source, and it would have to sit out all night. Plus, I had done the whole s’mores thing over and over already. Then I contemplated an ice cream bar, but I was concerned that sitting ice cream would melt and get all messy. That’s when I came up with the idea of a waffle bar! I mean, who doesn’t love waffles. I practically make them every Sunday for breakfast. So this would be easy. Similar to an ice cream bar, I could offer a number of different toppings to go with it. I already had a Belgium waffle-maker, so all I needed to get were all the extras. 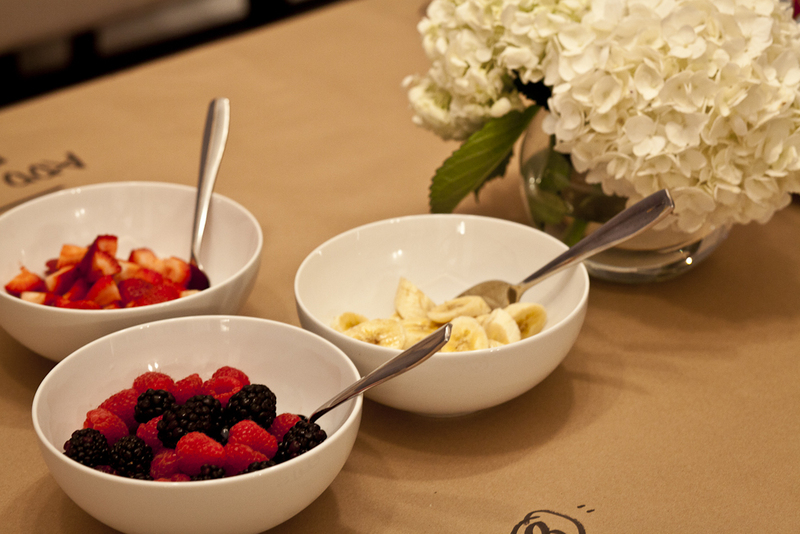 I ended getting some fruits, different spreads (Nutella….Mmmmm! ), and of course whip cream and nuts to top it all off. Normally for parties, when it comes to the layout, I like to go all out. I go with a theme, create coordinating banners and food labels, and have matching napkins and tableware. But since I didn’t have time to do all that this time around, I decided to just write directly on the table (sort of). It was easy, simple, and quick. 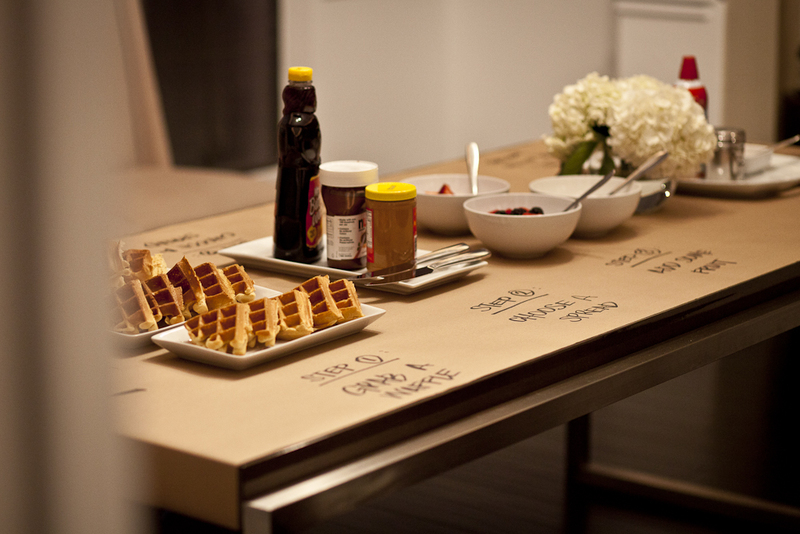 I used kraft paper to cover the table and once I had everything laid out, I labeled it all. To make it a little more interesting, I wrote out “steps” at each section of the waffle bar. For a last minute thing, it sure turned out great! Everyone seemed to have a really good time with it. It was interactive, fun and delicious, if I do say so myself. I am so excited to have found this post! I was just asked to serve breakfast for Teachers who preview the Bookfair before it opens to the school–and I am not one to just bring a box of donuts and a jug of juice! I make waffles almost daily (my son loves them, so I just make a bowl of batter and keep it on hand in the refrigerator), so I LOVE this idea! I ordered a second 4-square belgian waffle maker this afternoon. 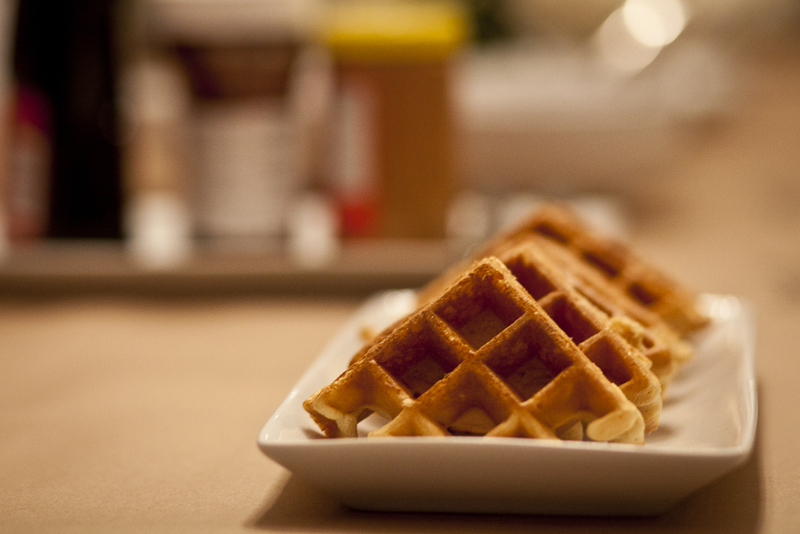 I am going to try and make the waffles fresh for the event, and have asked another mom to help! I can’t wait!!! Cool! Hope it works out well!! What a great idea! This would be great for Christmas Morning! This is great! I am planning my baby girl’s first bday and we will be serving chicken and waffles :), do you have a good recipe for waffles? Can I ask you how far in advance can you make them? I’m wondering if you premade the waffles and set them out if they were eaten cold? Or how did you serve them, cold or hot? I love this idea but am wondering how many people you served. Could this work for a bridal shower of 25 – 30 along with an egg casserole & salad. I’m just concerned about keeping them at least warm. Thanks! The party I did it for was about half the size, 12-15 people and it worked fine. For a larger party like yours, you could always make the waffles a head of time then warm them up when the guests arrive. Warming in the oven for a few minutes works great – they’re not soggy that way! Where did you purchase your kraft paper and what size did you use? Thanks. Hi Denise, I happened to have a huge roll. Can’t remember the width of it, but it nearly covered our dining table. My husband got it from work…they use it in their shipping department. You can usually buy paper from a roll at teacher supply stores. You buy it by the yard (less than $1/yard). But not 100% sure they sell kraft. I don’t see why they wouldn’t!